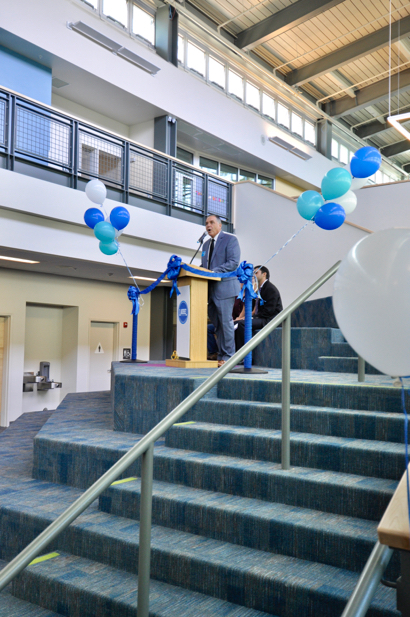 The community and parents got to see what students saw when they walked into their classrooms on Monday, October 17, when Laurel Upper Campus officially opened. Today, school and district officials gathered to commemorate the brand new school as well as celebrate Laurel winning a 2016 National Blue Ribbon Award. The Upper Campus, located at 275 Elliot Drive, serves 300 students in grades 3 to 5. 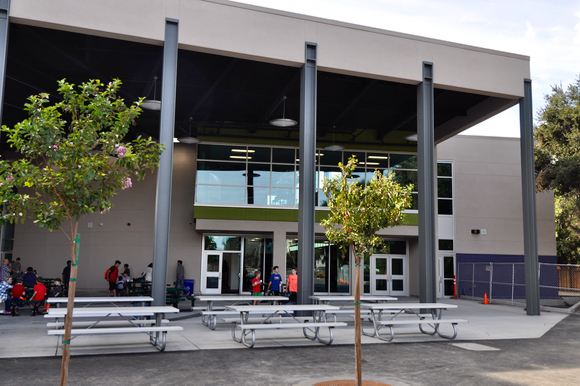 The two-story school was funded through a $23 million bond measure passed by voters in 2013. It has 16 classrooms as well as facilities for science/technology, math, art, and music and playground/sports fields. It relieves overcrowding at Laurel Lower Campus and Encinal School. Photos by Linda Hubbard (c) 2016; top photo – front of school;, middle photo – Superintendent Maurice Ghysels, who is retiring on July 1; lower photo – covered eating area. Refreshments were provided by neighboring business, Cafe Zoe.